Some coaches like to do things by feel. I’m not that type of coach. I’m a system guy. I like order and organization. In the weight room that means having a plan. And when I’m teaching technique it means having progressions. To me using progressions is like having a system. » Learn more: Nick Garcia shares and demonstrates his teaching progressions for the shot put and discus in our latest video lesson. Every year we get a dozen new throwers on our school’s track team. This presents a challenge: we have to teach a large group of young throwers a completely new movement from scratch in a matter of days. Without clear progressions, I have no chance. Over 17 seasons at Notre Dame High School I have slowly refined my own progressions thanks to the influences of too many coaches to name that I have been lucky to learn from. I lay them out in detail in the new HMMR Media Video Lesson 17. After teaching throwers the basics of how to hold and release the implement, we break training into two alternating days: a front of the ring day and a back of the ring day. The front of the ring day consists of stand throws, half turns, and wheels. The back of the ring day consists of 90s, walking throws, and then full throws. You can consider that month one. The reason I do it like this is because beginners often have trouble focusing on too many things at one time. By focusing on the front of the ring movements on one day and back of the ring on the next day, they can pay more attention to the details. Once they develop proper movement patterns we begin to mesh those two days and emphasis the whole throw in each training. Then as a last step we drop out some of the drills and keep in only the most important part of the progressions or, in some cases, the drills they need to improve on to use during practice. One thing to remember is that just because it is a system doesn’t mean it has to be a fixed plan. Moving from one step in the progression to the next is not just a matter of number of reps or days, it is a matter of proficiency. Athletes have to earn the right to progress. That might be faster or slower. The best systems aren’t rigid, they are flexible. 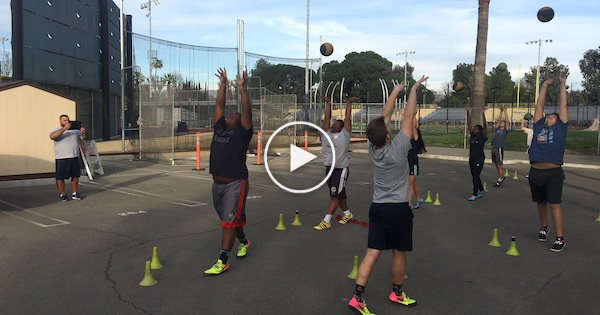 However if the steps are small enough, most athletes can move along the progressions quite quickly. Check out all the videos to see for yourself how the pieces fall in place.